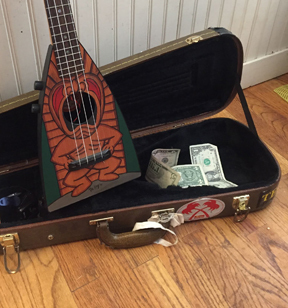 Circa 1950's Plastic Ukulele Made in the USA by Emenee. Features illustrations of a Majorette, a hepster in a raccoon coat, teenagers in a jalopy, and a coulpe dancing on the soundboard. Headstock has a girl with a ponytail strumming a Ukulele, with "Band stand Uke" above and "Emenee Musical Toy" below.